Once upon a time, Surface was at the forefront of what HOPA could do. 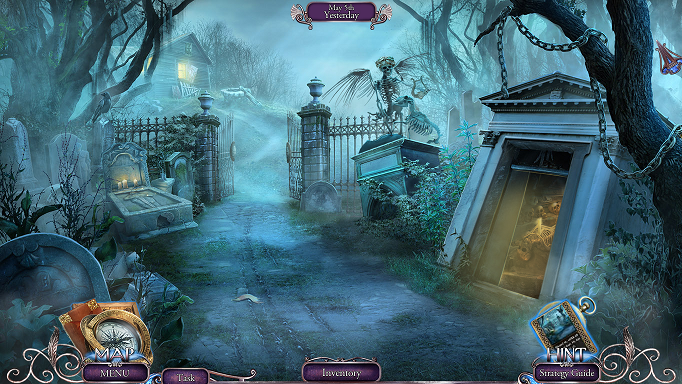 Hell, together with Mystery Trackers and Grim Tales, Elephant Games was one of the leading forces in deciding the trends of HOPA. But it’s hard to deny that they’ve gradually falling to the side in growing opposition from studios like Mariaglorium, Mad Head and, of course, Eipix. And Game of Gods is a perfect example of how they’re consistently missing the mark. 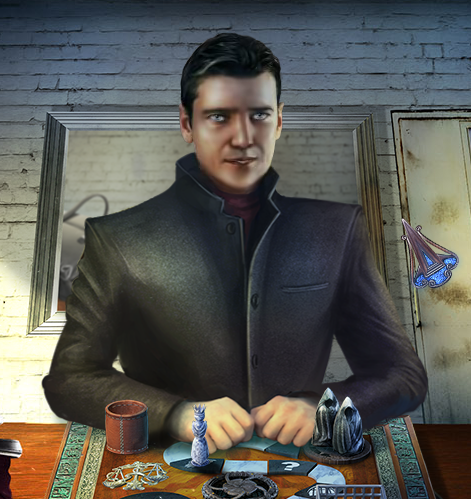 Years ago, when I started playing HOPA, Surface was one of the first series I ever came across and it sort of helped to cement early on what I expected out of HOPA. The first one took me to an alternate dimension, the second one brought me into the mind of a comatose woman and the third revealed a flying city way up in the clouds. They were, in retrospect, perhaps not the most original games in terms of design but the stories were varied and there was a real charm to them. But with the fourth one, it felt like the games were starting to become rather repetitive and I’ve spoken in quite some detail what I thought about the fifth game. Though I came away from that game with positive thoughts, time has dulled this appreciation and I’ve started to pick the game apart in my mind. But rather than go back and re-review it, I’ll take out my frustrations on the sixth game in the series. You love your friends and there’s simply nothing you wouldn’t do for them. Or so you’ve said for a long time. But when you arrive late to an experiment that your friend promises pays handsomely for participation, you find that your three best friends are missing. A stranger appears in front of you and tells you that the only way to save them is to play the game. But it’s not just any game. Not only does your friends’ lives hang in the balance but the entire world’s. With the odds stacked against you and your friends missing somewhere in the game, can you beat a game of gods? If there was ever an inspiration for this game, it’d be Jumanji. The premise is very similar where you roll the dice and you’re given a challenge to complete. Except these challenges have very real consequences in the real world. 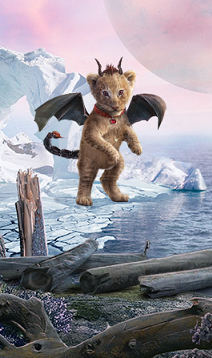 But whereas Jumanji tried to woo the children with equal parts adventure and fright, Game of Gods simply does… nothing at all. The premise is very interesting, though: a game that has to be played every three years to satisfy the gods within lest they go on a rampage. And the game continued to promise great things when you were allowed to pick your own game piece, each with its own abilities which I assumed would come into play as you played “the game”. My piece, for instance, was “good with animals” and the others each had their strength. In my optimistic brain I assumed this would lead to different solutions to certain puzzles or perhaps let you bypass certain sections outright. Unfortunately, any such hopes was immediately bashed as once you place the pawn on the board, it transforms mysteriously into the White Queen. And the dice are ornamental at best, like the kind you see hanging on particularly shallow guys’ rear view mirrors. You click on them and instead of being random, leading to a random environment with puzzles to solve, the number is set and you always end up in the same place. Because there’s a plot you have to follow which would’ve been fine… if the story wasn’t awful. But more on that later, let’s talk more about how the gameplay simply doesn’t live up to the expectations. 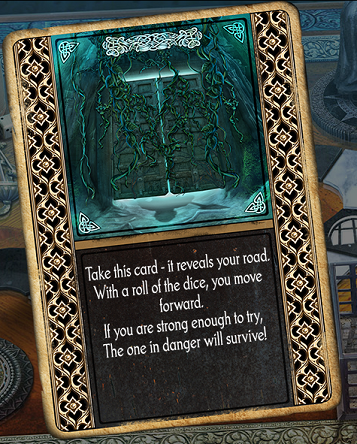 The game also includes cards found at regular intervals and I expected these cards to add a bit more randomness or perhaps a recurring element. Like, find a fire card and use the fire card regularly and creatively through the game. But no, they’re one-time inventory objects that you use to progress in the game… like every single other object that you find. So why set it all around a board game if you’re not gonna use the mechanics of a board game? The story didn’t really need the extra boost, it’s generic enough to fit into any random game and the game never, ever really uses the opportunity to take you to any environment that’s so fantastic and unique that it warrants the board game setup. 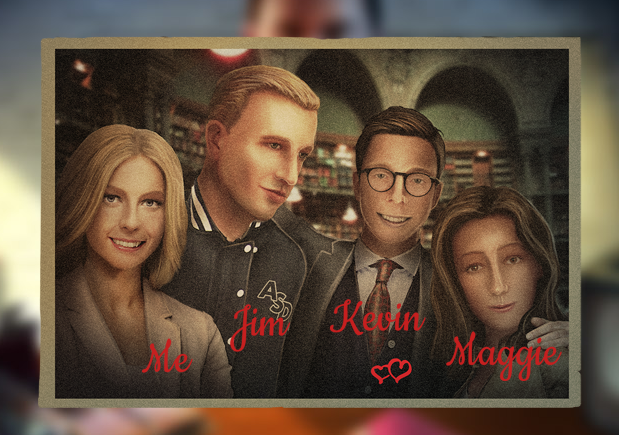 It only gets “weird” in the final act and the bonus game. And we’re talking about gods who manipulate the environments at a whim, why are we trudging through dark forests, gray dungeons and white mountain tops? But what’s worse is that underneath all of the generic blandness is a good idea. At some point someone had a really ambitious idea that got put through the wringer before being delivered to our doorstep. At parts you see an almost dark sense of humor oozing out of the pores, completely clashing with the seriousness of the rest of the game. Talking skeletons and chimeras turning into adorable little helpers in the midst of what pretends to be a pretty serious game. And if they’d just gone in that direction with the plot completely… it would’ve been an awesome game. But it simply doesn’t have the focus needed and prioritizes something utterly generic over what’s actually interesting. The lives and fates of everyone who played the game before the “White Queen” appears far more fascinating and a part of me was hoping we’d get to play their doomed adventures in the bonus game. Like Sir Leroy, a knight who came far but faltered before the finish line, or the Madman, a player who fell to the gods’ whispers. All of the stories that we briefly get to glimpse are far more interesting than anything ever done with the protagonist and her friends. Or with the “Stranger”. Even though he’s a far more interesting character, again the game does nothing with him. He’s the leader of the organization the makes sure the game is played every three years to keep the gods contained. And yet extremely little is ever said about this organization outside of the bonus game and even then it’s barely touched upon then. We’re told he has a family and that we should care but… I don’t. Because I don’t know this man even a little bit. Throughout the main game he only appears periodically to say something entirely unnecessary and cryptic that’s supposed to tell us more of the plot but nothing that isn’t blindingly obvious through just playing the game. How is the organization structured? How long has it existed? Since the game was created or since modern times? Are they evil or good or neither? Are they magical? Are they the government? Oh, sorry, I forgot I was supposed to give a damn about the protagonist and her friends who receive little to no characterization and even if they did I doubt they’d be very interesting considering nothing about them seems very interesting. So what does the game have then? Well, there’s the gameplay and it’s passable. At most. Because even here there’s nothing unique to really talk about. The game is loaded with minigames and puzzles but none of them stand out or even challenge you all that much. 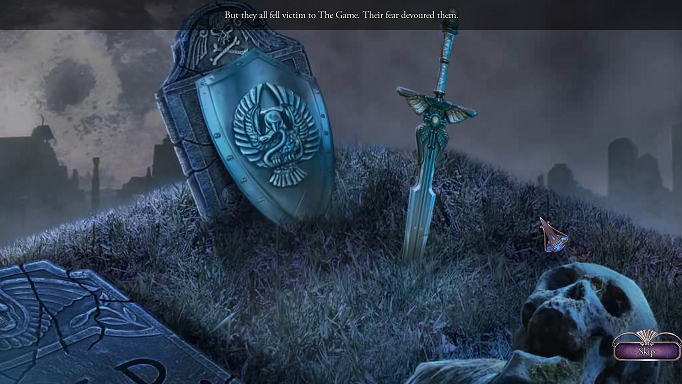 In fact, there was so little challenge that the game was over in about three hours which is criminally short for a HOPA. I mean, four is the average and one hour less might not seem like that big of a deal but it’s 25% of the average play time for an average HOPA. If it were three thoroughly enjoyable hours it’d be one thing but they’re not. It’s a fodder HOPA, there to fill the space between worthwhile HOPA. But no, it’s the same puzzles as always coupled with the same minigames we’ve all seen before and done better. Steer a sled by picking lanes and avoid debris, whack-a-mole, that sort of thing. 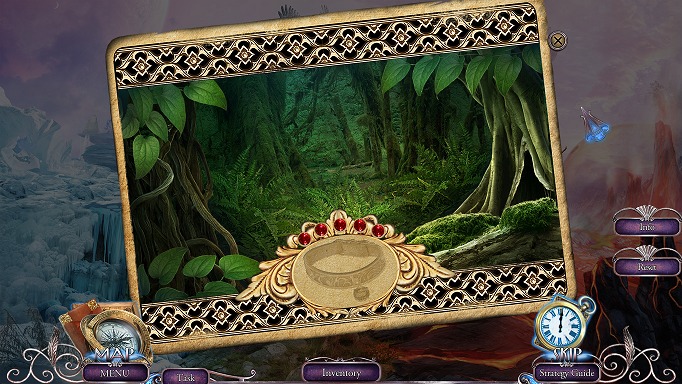 And the hidden object scenes? They’re okay, I guess. There’s some variation in the setup, standard list scenes mixed in with silhouettes and word association… sort of. Nothing we haven’t seen before, true, but they’ve been done better and they never offered anything truly challenging. If it hadn’t been for some being dialog-tied none lasted much longer than two minutes or so, never above three. Even the dialog-based ones were fairly short and yet felt like an eternity. So it just barely manages to scrape together passable gameplay out of what should’ve been another slam dunk for the Surface series. But it seems like they’re less interested in maintaining Surface’s identity as a trailblazer in terms of subject matter and more interested in the same game everyone else is making. It’s the same pretty environments we’ve seen hundreds of times by now and with a setting like this, that shouldn’t be the case. So what does the game have left? Well, graphics and sounds and while a game shouldn’t rely on that, there have been times when the graphics simply are that impressive or the soundtrack just awes you so much. And while the graphics are good and the music stellar, there’s still something off about both of them. 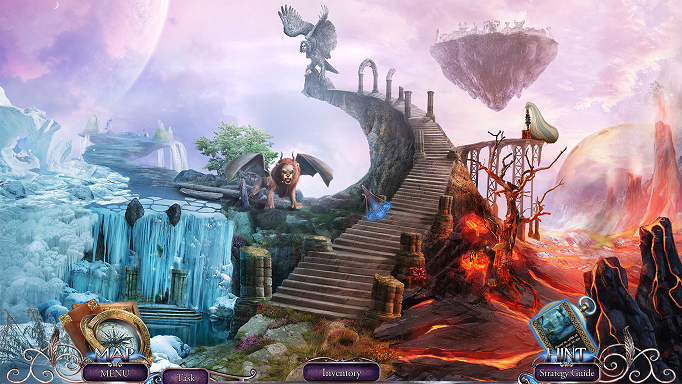 Starting with the graphics, the environments themselves are great and the puzzles and hidden object scenes are top notch. I do wish they’d employ some more interesting design in terms of puzzles as blue is, yet again, very dominant with the odd splash of red. Again, we’re talking about an adventure taking place within a board game and yet the game doesn’t take us anywhere special and the colors are eerily similar to what you’d see in nay other game. But there’s nothing wrong with the fidelity, it’s high quality art and I’d be telling a lie if I said otherwise. But what isn’t high quality are the characters and the animations. The characters in particular range from decent to grade-school-awful and the animations are really low-grade and a really basic approach to using warping to stand in for actual animation. The faces never move in a natural way, stretching and turning in ways that the human face was never meant to do. And it’s consistently bad too, ignoring the fact that huge strides have been made in this field even in the HOPA industry. I understand that they can’t measure up to the regular industry with their millions upon millions in budget but this is embarrassing even for 2014. If the artist isn’t comfortable doing faces and animation, maybe don’t ask them to do it. It’s not like there’s a shortage of good artists in the industry at the moment. As for the music? Well, it’s good. No doubt about that. I saved the soundtrack in a heartbeat and I listen to it regularly. So what’s wrong with it? Well, for one, it’s simply too loud, getting to the point where it drowns out EVERYTHING. Any sort of epic moment is quickly devalued because the music quickly becomes obnoxious due to its volume. But worst part is that it doesn’t really fit the tone of the game or the current scene. In a better game, perhaps one that embraced the dark humor you sometimes see, it would’ve been fitting at times but the game is never epic nor energetic enough to have room for this music. Overall the game just doesn’t feel like it knows what it was going for and feels extremely cobbled together. The music definitely wasn’t made for the game, the environments are fantastic but the animations are janky as hell, the gameplay is generic but the game has the seeds of a good idea in there somewhere. It pretends there are choices to be made but in reality you’re on the same tracks as everyone else. You’ll run across knights and cowboys and people from all ages but it lacks a common thread to tie it all together. In one breath you talk to a pirate skeleton that lost its body and in the next console a grieving ghost that wants to be reunited with the love of his life. And it… doesn’t really work. 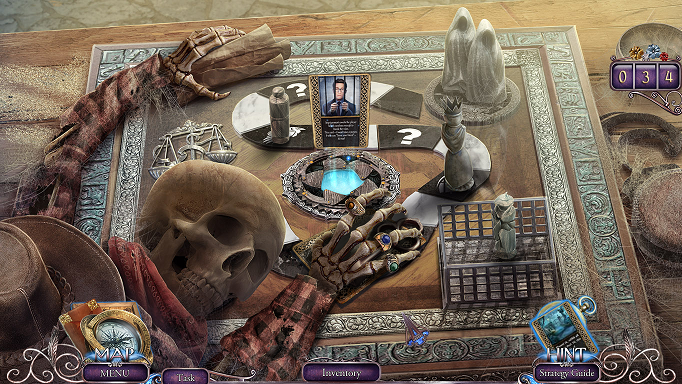 It really wouldn’t surprise me if this game was put together with the leftovers of three other HOPA. It’s just a mess. The idea of a board game couple with HOPA is such a brilliant idea that I hope someone at some point picks it up again. As long as it doesn’t promise too much and doesn’t deliver!